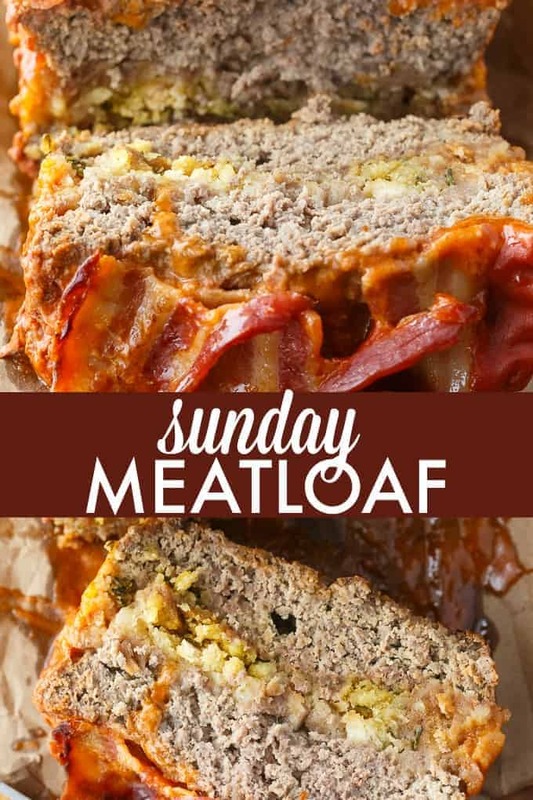 Sunday Meatloaf is a delicious family recipe! 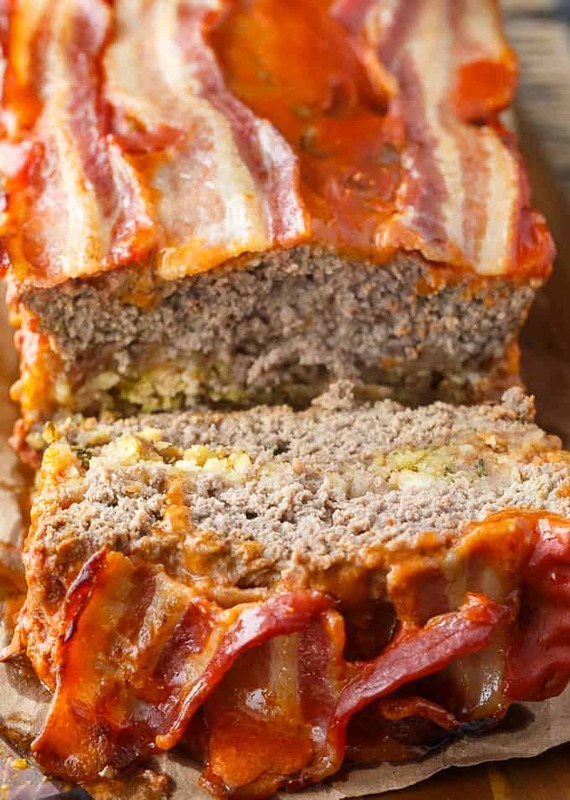 This easy meatloaf has a flavorful stuffing filling and is topped with a mouthwatering tomato sauce and bacon. Though the recipe says Sunday Meatloaf, you could really serve it any day of the week. I call it Sunday Meatloaf because it’s not your ordinary meatloaf. It’s jazzed up with a yummy stuffing filling and bacon. Everything tastes better when you add a little bacon, don’t you think? I served this recipe to my boyfriend’s parents and they raved about it. Everyone was talking about how good it was. That made me happy. I always like to hear when people enjoy the food I make. The beef is moist and tasty. 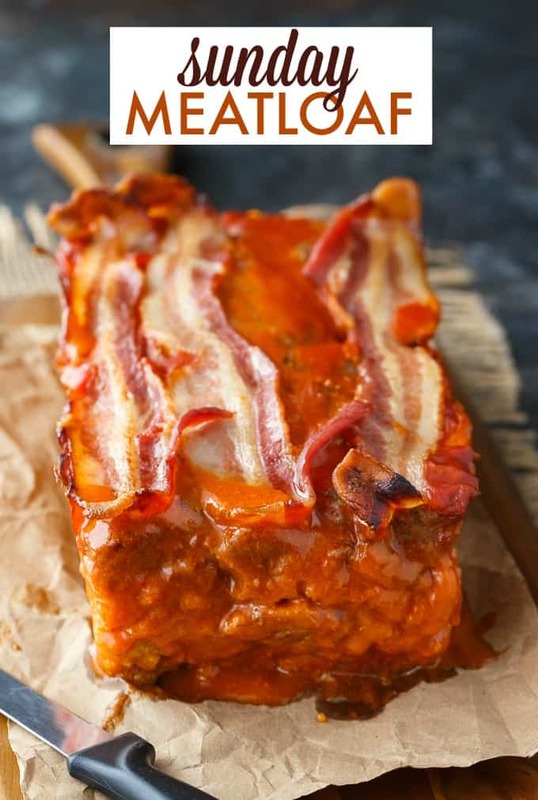 There is nothing worse than a dry meatloaf and this recipe is definitely not that at all! If I had to pick a favorite component of the recipe it would be the stuffing filling. It’s just Stovetop Stuffing. Super easy! Ready to make some Sunday Meatloaf? 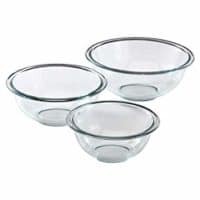 The first step is to grease a loaf pan and set aside. 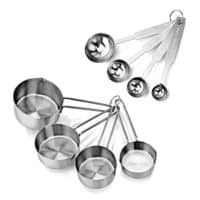 In a large bowl, mix together ground beef, salt, eggs, pepper, evaporated milk and Worcestershire sauce. You can use clean hands to combine it all, if you wish. Then, spread half the meat mixture into a loaf pan. Spread the stuffing mix right from the box on top of the meat mixture in the loaf pan. Top it with the remaining meat mixture. Then it’s time for the topping! Spread the tomato soup on top and place the bacon strips on top of the tomato soup. Bake the meatloaf for 1 hour at 350F. 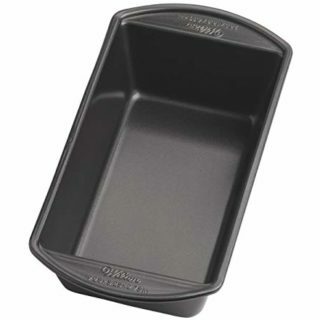 Tip: put the loaf pan on a baking sheet to catch any overflow. Yes, you can freeze meatloaf. I typically bake the meatloaf first and then put it in the freezer. Wrap it up tightly with This way, you’ll have dinner all ready for those crazy busy days. Make sure to completely thaw the meatloaf in the fridge before you reheat it. Meatloaf will keep about 3 days in the fridge. That is, if you have any leftovers! Want more meatloaf? 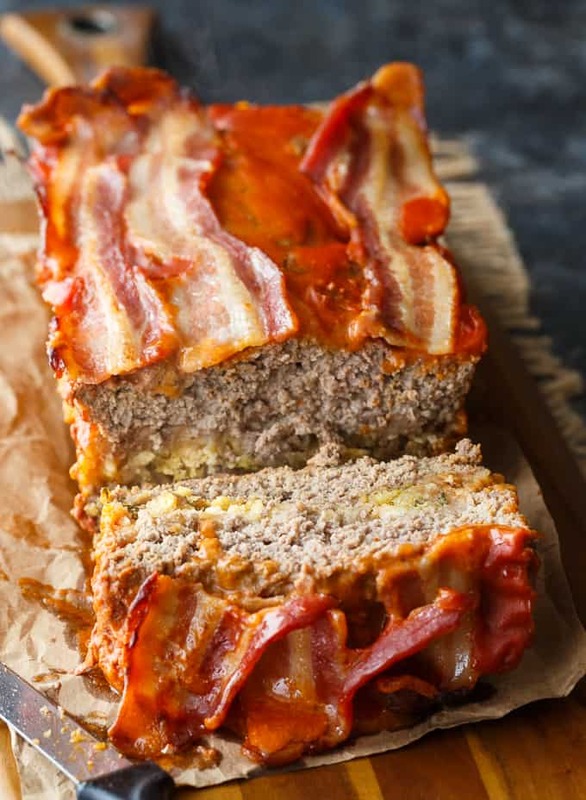 Try these delicious meatloaf recipes. Indian Meatloaf: Not your momma’s meatloaf! 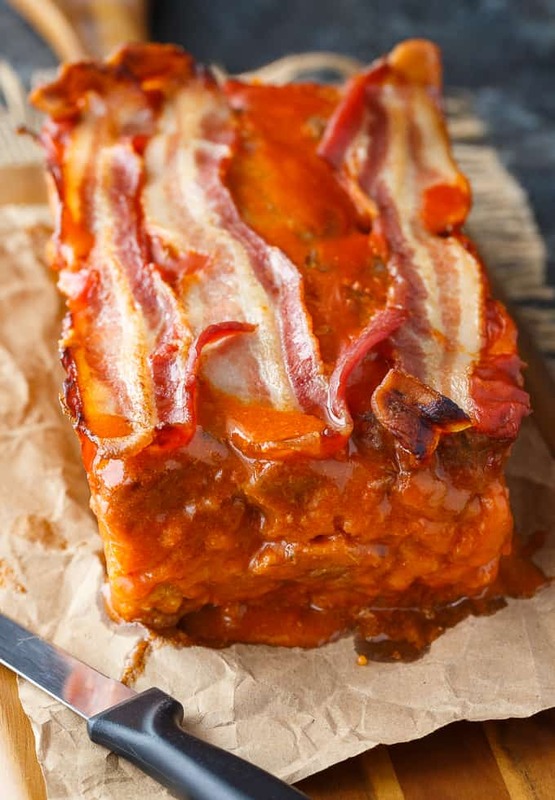 This is Indian Meatloaf recipe is packed with spicy exotic flavours of the far east. 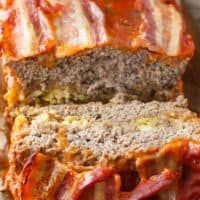 Mexican Meatloaf: A spicy twist on a classic recipe! This Mexican Meatloaf is packed with beef, cheese, seasonings, chilies and salsa. The results is a mouthwatering meal! Ground Turkey Meatloaf: Save a few calories without sacrificing flavor with our tasty ground turkey meatloaf recipe! Old Fashioned Skillet Meatloaf: This classic meatloaf recipe cooks to perfection in a cast iron skillet. It always makes me think about Sunday dinners at Grandma’s house as a child. You’re going to love it! Caribbean Meatloaf: Juicy with a sweet tang! 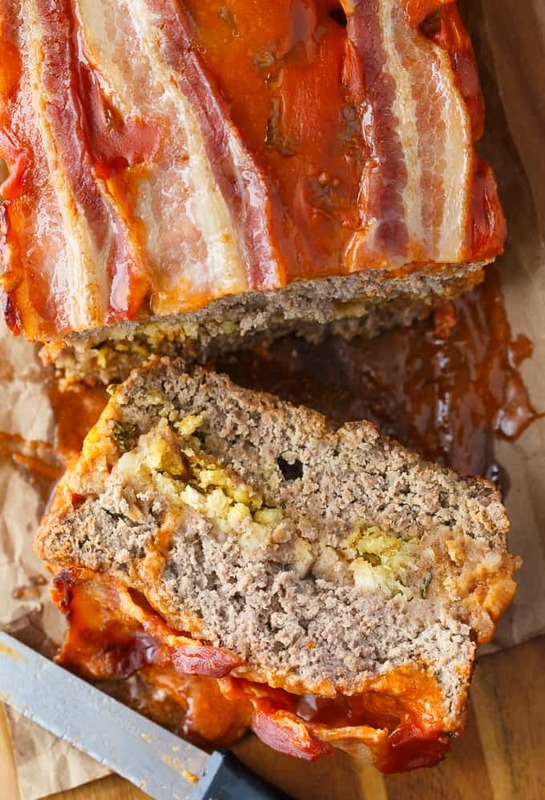 This easy meatloaf recipe is a surefire hit. How often do you serve meatloaf in your home? A delicious family recipe! 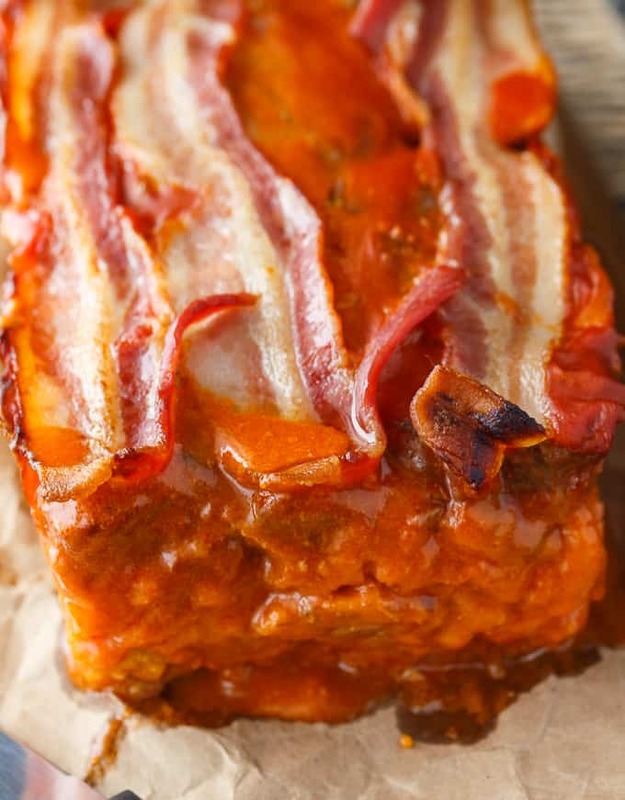 This easy meatloaf has a flavorful stuffing filling and is topped with a mouthwatering tomato sauce and bacon. In a large bowl, mix together ground beef, salt, eggs, pepper, evaporated milk and Worcestershire sauce. Spread 1/2 mixture into loaf pan. Spread stuffing mix on top of meat mixture in loaf pan. Top with remaining meat mixture. Spread tomato soup on top. Place strips of bacon on top of tomato soup. This sounds so yummy! I love that the surprise is inside. I have never thought to put stuffing in my meatloaf , but I am definitely going to try this recipe. Thanks so much for sharing.